Every year the most passionate fans in football, the fans of the National League, cry out on social media for the greatest league in the world to ‘get in the game’, only to be ignored time and time again by EA Sports. Last year FIFA included the Chinese Super League in their latest edition, frustrating National League fans up and down the country. The Chinese Super League is home to some of the world’s richest clubs with some of the shortest histories, and as any of the National League’s tens of thousands of fans will tell you, you just can’t buy the magic of a Tuesday night away in drizzly Dover. Without the Vanarama National League ‘in the game’ how will real fans ever be able to recreate an upset on the scale of Exeter City getting a draw at the Theatre of Dreams in the FA Cup in 2005, Frustrating Ferguson’s first team legends Ronaldo and Scholes (now of course a National League club owner). Without the world’s most loved league being included in FIFA 20, how will gamers relive the magic of Matthew Hanlan of Sutton United knocking the holders, Coventry City, out of the FA Cup in 1989? These were once in a generation moment that stay in the memory of real football fans forever, a Europa League second round mismatch does not come close. This season the appetite for The Vanarama National League has been bigger than ever with an average attendance of 46,811 across the league each week, and select games shown live on BT Sport. The demand is there, and thousands are expected to sign the petition that calls for EA Sports to finally put proper football in the much-loved video game. Andy Alderson CEO and Co-Founder at Vanarama said: “We love being involved in non-league football. Its proper football, with proper fans. The Vanarama National League is growing year on year and deserves to be recognised in FIFA 20. EA Sports need to stand up and take note and give the best fans in world football what they want. If it’s in the game, it’s in the game – come on EA live by your mantra!”. 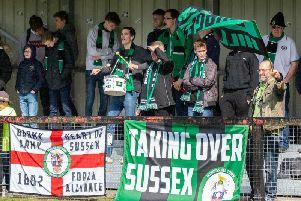 David Bernstein, Former FA chairman said: “This campaign when successful will make a real commercial difference to the financial challenges facing non-league football – in addition to putting a smile on the faces of some of the most devoted fans in the world”.